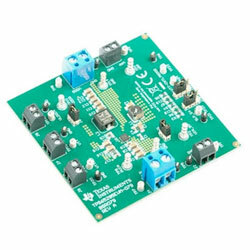 Texas Instruments TPS65295EVM-079 Evaluation Module promotes an expansive evaluation of the features and performance of the TPS65295. The TPS65295 offers a total power solution for a DDR4 memory system in a compact package. The device satisfies the JEDEC standard for DDR4 power-up and power-down sequence demands. Some modifications can be performed to the Evaluation Module to test performance at various input and output voltages, current and switching frequency. The device is designed and tested for VIN = 4.5V to 18V and has a junction temperature of 25C for all measurements unless otherwise noted. The board input voltage range cover 4.5V to 18V; with output voltage: 1.2V VDDQ, 2.5V VPP, 0.6V VTT, and 12A i 17mOhm/6mOhm Rdson FET Converter, in a complete DDR4 power solution. The device is offered in a 3mm x 3mm HotRod QFN package.